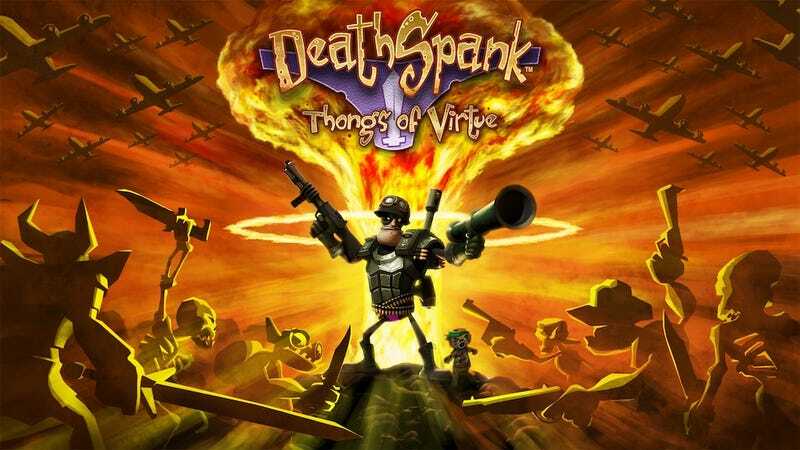 DeathSpank: Thongs Of Virtue is video game deja vu if deja vu involved feeling like you've done the thing you're doing before — but maybe not ever before in a boat. Style: You are DeathSpank one of the intentionally more dimwitted video game action heroes, and you are in a cartoon parody world in which you will be killing lots of silly bad guys with your comically-named weapons. Sometimes you'll be solving puzzles in this more modern sequel, like how to pass a drug test, evict monks or track down Santa Claus. Audience: People who like comically killing cartoon leprechauns, who like collecting lots of loot and armor (that means you, Diablo fans), and people who either missed July's first DeathSpank game or loved it so much they wanted seconds with different garnish. Why should I care about this game: Games seldom intentionally make their players laugh. This one can, thanks to good comedy writing from development studio Hothead Games. This is comedy writing for people who are amused by arguing with pirates, questing for magic thongs (ostensibly the point of the game) and using a few signs to foreclose on the homes of some of the game's hapless citizens. So, wait, it isn't funny? It is funny, if you like that sort of thing. In the right dose, the DeathSpank humor is good for chortles and can be smart, such as during those few times the writers dared to get contemporary and make jokes about the economic crisis. DeathSpank 2's big problem is that DeathSpank 1 just happened, and the humor doctor doesn't advise two nine-hour doses so close together. But at least the sequel addresses the first game's problems, yes? Wait, who is telling jokes now? No, the sequel does not mend the faults of the original, because Thongs of Virtue was made contemporaneously with DeathSpank: The Original. Hate the old inventory management system that forced you to prune your haul of items and armor every 10 minutes? Wishing the enemies didn't sometimes run back to their spawn points, health bars re-filling as they momentarily turn invincible? These losing features return. You weren't hoping for online play, were you? Stop reviewing the last game. Review this game. Fair point. Thongs of Virtue will be new to some gamers and those players, I suspect, will have the best time. DeathSpank, like Borderlands last year, is a hard game to stop playing. You are given dozens of goofy fetch and assassination quests are constantly gaining experience points with each kill, improving your armor, finding new weapons. The classic formula remains delightful. To do such things in a comedy world is a good bonus. Surely they changed some things worth mentioning? Your co-op buddy can play as a guy named Steve who rides a unicorn and shoots throwing stars. Steve's cool based on his name alone, but he's merely a drop-in/drop-out buddy, as was the returning other co-op option, Sparkles the Wizard. More interesting is the addition of guns. Flamethrowers, machine guns and bazookas, once you master using them, make boss battles easy and combat a more varied mix. Bummer about DeathSpank being so vulnerable to his own grenades, though. What about that boat that you felt you had to mention way up top? Oh, the boat! This review simulates the wait players have before they get DeathSpank's franchise-first vehicle. Three-quarters into DeathSpank's adventure you get your boat. It's a nice boat. But it doesn't do much. It's like fast-walking on the water. Buy it: If you liked the first DeathSpank and would enjoy more of that in a more modern setting. Or if you like to laugh while clubbing mountain trolls and eating virtual cheeseburgers. Don't buy it: If one DeathSpank in your life is enough or if you don't like interactive cartoons. The bottom line: The new DeathSpank came too soon for this fan of the first, but the gameplay formula and style is enjoyable enough that recommending either of the games is a coin flip. As disconnected as they are, with nothing carrying over from the first except loose plot details, you could skip either and still have a good time. DeathSpank was developed by Hothead Games and published by EA for the PlayStation 3's PlayStation Network and the Xbox 360's Xbox Live Arcade on September 21. Retails for $15.00 USD. A copy of the game was given to us by the publisher for reviewing purposes. Played through the campaign,which took about an hour more than the last one.